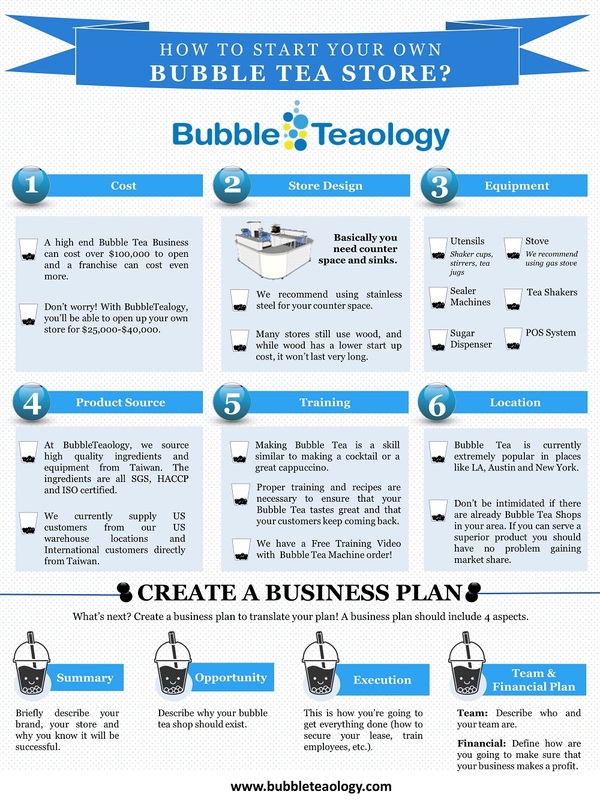 Before you can start your bubble tea store you will need a plan. The main purpose of writing a business plan is to show that you have clearly thought out your business ideas, evaluated the competition, know the costs of running your business, the potential profits and fully understand the risks of opening a bubble tea shop. When you write a business plan, you want to follow a specific format and show your investors that you are organized, responsible and know every aspect of your potential business. What’s in a Bubble Tea Business Plan? Executive Summary This is the 200 hundred foot view of your business plan where you briefly describe your brand, your store and why you know it will be successful. Example: BubbleTeaology will be an amazing Bubble Tea Shop in Chicago, IL. The modern design will fit into a 500 foot square location that is newly constructed in ABC Shopping Mall. BubbleTeaology will be convenietly located in the food court which receives over 10,000 weekly shoppers and potential customers. Our colorful shop, smiling employees and authentic Bubble Tea will entice customers to try our expansive menu where we offer premium Bubble Tea made with 100% Taiwanese Ingredients. The executive summary should be 1 to 2 pages and if you’re stuck on this one, you can write it last. Opportunity: Here you describe why your bubble tea shop should exist. Are you the first one to the area? Do you have a unique selling proposition or a unique background that makes you suited to sell bubble tea and out preform the competition? Execution: This is how you’re going to get everything done. How you’re going to secure your lease, build your store, train your employees, source equipment and supplies. Also, how will you build you establish and build your brand, get new customers and keep existing customers coming back for more. Team and Company: Your team and company will all start with you but you won’t be able to do everything by yourself. Investors want to be confident that you can find, train and hire great employees who will make sure your bubble tea business plan is a success. Here you will also want to go further into how your brand was created and why it is going to crush the competition! Financial Plan: Financial plans are crucial to banks and investors. How are you going to make sure that your business makes a profit. You will have both fixed and variable costs in your business. The fixed costs will be things like your rent which will not change every month. Variable costs will depend on how much business you’re doing and will change every month. For example, you might need 2 employees working at a time to start out but once things get busy, you will need more and this variable cost will increase. You will also need to calculate your costs and profits. The best way to do this for a bubble tea shop is to think about your costs/cup and how many cups you need to sell a day to first break-even and then to make a profit. While writing a business plan for your bubble tea shop can seem like a daunting task, it will also help you organize and clarify your ideas. Not only will this help potential investors but it will help you and give you the best chance of success. will help to solidify your own vision for your boba tea store. It will also be necessary to show to any investors or partners that you may have. Also, if you require a loan from a bank than a business plan is an absolute must. Sign up below to receive our free ebook on how to open a bubble tea shop to get some more ideas! Most bubble tea shops will use 50-100 grams of tapioca pearls for a 700ml cup of bubble tea. So this will be about 50 for a 500ml bubble tea. The ingredients will cost about $0.70 for a 500ml (16oz) cup of bubble tea. I love this post, it’s very informative but I still do have some questions. I would like to speak about getting ingredients sent to my country. Thanks for contacting us. I just sent you an email. I hope you find the information helpful. Let me know if you have any questions. You can open a bubble tea store in a very small area. The minimum is about 200 square feet. I have been given 162 sq ft to start my bubble tea shop, will that be enough , I know you said the minimum is 200 sq ft but can this still be effective? Any ideas on where to get a point of sale system specific to bubble tea, or will any common system do? I am looking to get started and would appreciate some direction and information. Thanks. Hey. I’m very interesting in that idie and I want to open bubble tea kiosk (for start) in my location. Hi, I’m thinking of opening a bubble tea shop, but not sure where to start with the recipe. I really appreciate some information from you. My phone number is 206-330-7105 and my email: [email protected]. Thank you and look forward to hearing from you! Hello im rene martinez and i live in miami , florida as ive seen there is not alot of these bubble tear stores and o love bubble tea , im interested in opening a small location . Please help and thank you! I would like to see if you are mind to share some of your top direct Taiwan Bubble tea suppliers’s direct contact information and their websites? Thanks! Good evening，I am interested to open a boba tea in Tempe.But now I am confused that what is the requirements of the kitchen?Shall I must have exhaust fan Machine or other high-costed machines according to government law?If the cost of kitchen is low, I think I can try to open one in Tempe.waiting for your reply. Hi Trish, thanks for contacting us. I sent you our free ebook “How to Open a Bubble Tea Shop”. Let me know if you have any other questions. Are you able to send me the free ebook also?. Thanks for contacting us. I am so happy you found the post to be informative! I just emailed you a copy of our ebook. If you have any questions, please let me know. Can you please send me a copy of your ebook as well? Hi mike, can you please send me one ebook too? Hi Mike! Me and my husband are on our study in opening a bubble tea shop and hopefully would be able to make it into a reality 🙂 Appreciate if you can share your ebook, it’ll surely be a great help! Thanks for contacting us. I would be happy to share our ebook with you. Please let me know how your store is coming along! Hello Mike, I would greatly appreciate if you could send me the ebook as well. My email is [email protected]. Can you please send me a ebook to me? I’m writing my business plans now and I need more idea or details informations on Point of sale. Thanks for contacting us. I just sent you our free ebook “How to Open a Bubble Tea Shop”. Let me know if you have any other questions. I have a plan to open bubble tea shop in Orange, CA and I need more informations. Can you send me the ebook. My email is [email protected]. May I have that free eBook as well Mike? Hello, my name is Nicole and I am very interested in opening a boba tea shop. Please contact me at 9168380129. Hi Nicole, thanks for contacting us. I sent you our free ebook “How to Open a Bubble Tea Shop”. Let me know if you have any other questions. Hi Can you send me the free ebook plz? Also would you be interested in opening a store in London? can you please also send me a copy of you ebook on “how to open a bubble tea shop. Thanks for contacting us. I sent you our free ebook “How to Open a Bubble Tea Shop”. Let me know if you have any other questions. Hi Mike, I am planning to open a bubble tea shop in New York, would you please send me the ebook too? Many Thanks. Mike – can you also sent me the ebook. I am looking to open the first bubble tea bar in my area. Currently in the beginning stages and need help getting it out of my head and into a shop. Thanks! Your information is very helpful. Do you provide the service to South America? I would like to open a shop there. I want to gain some knowledge about it, would you please send me the ebook? Hi Mike . Could you please send me some information about how to open a bubble tea shop. Thanks for that. Thanks for contacting us. I would be happy to pass on that information to you. I just sent you an email with our ebook. I am looking to start a bubble tea business . Please send me your ebook. Any other guidance you can provide will be appreciated. I am looking to start a bubble tea business in Las Vegas. Please send me your eBook and any other guidance you can provide. Much appreciated! Can I get free book as well? Thanks for contacting us. I would be happy to send you a copy. I hope you enjoy it. Please let me know if there is anything else I can help you with. Hi Lisa, I sent you our free ebook on how to open a bubble tea shop. Right now we don’t provide any of the permits or licenses as they vary from county to county. Let me know if you have any other questions. Hi Mike, I would love to have your free ebook as well. Please help. hey mike may i have a free ebook as well? Thanks for contacting us. I would be happy to send you our ebook! Please let me know if you have any questions. Hi mike may i have a free ebook ? I am willing to open a coffe shop having bubble tea too in a middle eastern country. Also, is it possible having someone come from Taïwan to form my team? Ordering directly from Taiwan is the cheapest way to get bubble tea ingredients. Although the shipping and import fees are something to be considered. I’ll send you an email with some more details. Could you share sourcing information from Taiwan? I am planning a bubble tea outlet in Yangon, Myanmar. Hi I am looking into opening a bubble tea shop. would you be able to guide me or provide me some information? Thanks for contacting us! I sent you an email with some more information. 1. I have been in Taiwan for some few years and so I found bubble tea interesting. 2. So I wanted to start up my own small bubble tea business here back in India in a small place called Dimapur. So is it necessary that a person has to be trained to open a bubble tea shop? 3. Third what important things be needed first for me to open a small bubble tea starter shop who wants to start asap. Thanks for contacting us! I think that is great that you would like to open your own shop! I have sent you an email that has information to help you answer those questions. Please let me know if you need anything else. Buying an existing business can be a lot cheaper but there are also a lot of variables. Such as why did they close their business and what kind of reputation did they have. I suggest searching for the business on Yelp and doing as much research as you can. If there is a lot of foot traffic than that is a good sign. Hello, I would like to open one bubble tea shop in boston. Can you please send me an email about the products, equipments and receipt costs? Thank you so much. Thanks for contacting us. I sent you an email with our product catalog. Would you be able to forward on some more info? Specifically product catalog, ebook etc? Thanks for contacting us. I sent you an email with our product catalog and ebook. hello,I am looking to open a small shop in CA. Can you help for more information like business plan and what kind of permit is required? Thank you, David. To find out what permits to use you will need to contact your county health department, each county is different. I sent you an email with our product catalog and ebook. Thanks for contacting us. We have bubble tea machines and a training video. I sent you an email with some more information, let me know if you have any other questions. Thanks for contacting us. I just sent you an email with information on our Bubble Tea Machines and Training Video. Hi, there are a lot of factors to consider when buying a bubble tea shop like location, customer loyalty, equipment, rent, reason for selling, etc. One way to evaluate a tea shop is using the multiple method. This takes the yearly revenue minus expenses and multiplies it by 1x-3x. The stronger the business, the higher the multiple. Hi mike I’m interested to open a bubble tea shop. Could you send me more information about it? Thanks for contacting us. I just sent you an email with our free ebook “How to Open a Bubble Tea Shop”. Hello, I am interested in opening a bubble tea shop in Naples, FL area. Can you send me some information. Hi, no problem! I just sent you an email with our catalog and free ebook. Hi, can i please have s copy of your ebook? Can you please send your free ebook “How to Open a Bubble Tea Shop”. I am opening a bubble shop in India. Thanks in advance. Thanks for contacting us. I just sent you an email and our ebook. I hope you find the information helpful. Let me know if you have any questions. I would like to start bubble tea business in Seattle Washington. Please help me with it. Thanks for contacting us, I just sent you an email! Hi, Mike! Please, send me more info about the bubble tea business. Can you please send me the free ebook also? Hi Jason, no problem! I just sent you your free ebook. Thanks for contacting us. I just sent you an email with our ebook and catalog. I am interested in opening a bubble tea shop in Anchorage, AK. Would you please send me an ebook? Hello, I would like to start a bubble tea business, I would like to know approximately how much money would I need in order to start this business. Can you please email me, thank you! My wife has a knack for knowing things and she says that I have to contact you about gathering more information about boba tea shops. As such I am doing my due diligence to reach out. We live in a very rural area however, we are on a high traffic interstate route where there just aren’t many places to stop. The daily projected transit is ~ 250,000. So in essence there is a new city passing by the potential location daily. Yes there are more reasons than a potentially new boba tea shop to stop: natural beauty, limited options for good rest stops, and other recent additions to the business area that have increased stopping traffic over 300%. I realize this is getting long, but I am not your average 3:00 am on a whim schemer. I am genuinely interested and I’ve obviously considered a number of factors, the most important being my wife is usually right about these things. Thanks for your comment. Traditionally bigger cities are better for bubble tea shops but your rural area might be perfect if it gets that much traffic. It could become an attraction on it’s own. I just emailed you our ebook, let me know if you have any other questions. I am interested in opening a tea shop in CA. May you please share with me some information such as the product catalog and ebook? Thank you so much!! Can you send me an ebook and catalog, as well? Will you send me an ebook and catalog? I’m interested in opening a boba tea shop and I’m new in this. Please help me with all the specialty and what to look for in this business. I’ thinking of purchasing a pre-owned shop. Please send me an ebook and other informations. Thank you very much! May I request for a copy of your ebook and catalog, for I too am interested in opening a Boba Kiosk. I’m new to opening a small business and any help would be of great help. Thanks for contacting us. I just sent you an email with our ebook. Me and my 2 daughters are planning to open a bubble tea business along the University belt here in the Philippines, But we really need your help with the recipes, equipments and permits required to set up. Your help is highly appreciated. Hello, I am thinking of starting a bubble tea business. May you please share with me some information such as the product catalog and ebook? It would really help me to get started and where to order products from. I would like to have more information about the price of equipements et the type of training one needs before opening a Bubble Tea. In addition, I would like to know what are the essential ingredients to make one ? Hi Mike! My name is Phuong Tran. Can you send me the bubble tea free book also? I really appreciate! I’d like to start a bubble tea shop and need you advice in setting up. Thanks for contacting us. We are happy to help you. Yes, we can ship to Australia. I just sent you an email and attached our catalog. I am looking to start a boba shop in Florida. Can u send me more info. I like your stuff and I am wanting to get a better understand with business plan, your eBook and definitely your catalogs. Do you have a physical store to which we can maybe visit in the States? Please let me know, thank you so much! Thanks for contacting us. We would be happy to forward along more information to you. I just sent you an email with our ebook. We have been in boba tea business over 15 years. We have over 10 locations nationwide. If you would like to get more information, please contact me at paradisesmoothie.us [email protected]. We’ll do our best to answer any question you might have. I’m from Philippines and I’m really interested with milk tea business. Can you send me a copy of your ebook for starting the business? Thank you. Thanks for contacting us. No problem! I would be happy to send you a copy of our ebook. Could I please get the ebook as well? Thank you for contacting us! No problem at all! I have emailed you a copy of our ebook. Let me know if you have any questions. Thank you very much for the information. For the last few years I’ve been dreaming about owning a bubble tea shop and finally I have some capital to start! I’m very excited to embark on this new journey and im happy to see there are kind people like yourself to share this information. If possible can I get a copy of your info book? I would greatly appreciate it. Thanks again for your time and efforts. Have a wonderful day! Thank you for contacting us! That is such exciting news! I just emailed you a copy of our ebook. Let me know if you have any questions. Aloha Mike! Can i also get a copy of that ebook? I would love to start a boba truck here on Kauai. Thanks for contacting us. That is such exciting news. Keep me posted on how things are going. I just emailed you a copy of our ebook. I am interested in Opening a bubble tea store, Can you please send me your ebook also information regarding from where I can soiurce all the materials and stuff ? Thank you for contacting us. I just emailed you a copy of our ebook. Please let me know if you have any questions. Thank you for contacting us. I would be more than happy to email you our ebook. I look forward to hearing back from you, after you have had a chance to read it. Can you please email me a copy of your ebook? I would like to start my own bubble tea shop. If I have question, can I contact you directly? Thanks for contacting us. That is exciting to hear! I just emailed you a copy of our ebook. Yes, you absolutely can contact me directly with any questions. Do you know, on average, how many drinks a boba shop sells per day? Not the super popular ones with lines out the door…just average popularity. I’m thinking ~1,000 SF store if that helps. Hi Nikki, the most popular ones can sell over 1000 cups/day. But the average is about 100-300 depending on the location. Hi, I would like to open a boba tea shop. Can you send me a copy of your ebook? Thanks for contacting us. I just emailed you a copy of our ebook and I would be happy to answer any questions. Best of luck to you! Hi Mike, would be grateful if you could kindly send through your ebook on how to set up a Bubble Tea store front. Thanks for contacting us. That is great that you are thinking about a Bubble Tea store front. I just emailed you a copy of our ebook. Let me know if you have any questions. Thanks for contacting us. That is great! I just emailed you a copy of our ebook. Please let me know if you have any questions. Hi Mike, I would like to open a boba tea shop. Can you send me a copy of your ebook? Thanks for contacting us. I would be happy to email you our ebook. I look forward to hearing about your boba tea shop. I’m working to open a boba shop on my university’s campus, and your information is so helpful. I would love to learn more about opening a successful shop with your ebook. Thanks for contacting us. That is exciting news! I have emailed you a copy of our ebook. I hope you find it helpful! Hi Mike I am interested in starting up a business. Can you please send me info? Thank you! Thanks for contacting us! I would be happy to help. I just emailed you a copy of our ebook. Let me know if you have any questions. I am interested in starting up my own bubble tea business. I would like to know more information about how to open a successful business. Thanks for contacting us! I would be happy to send you information about starting your Bubble Tea business. I just emailed you a copy of our ebook. I look forward to hearing back from you on how things are going. My wife and I are interested in starting a Boba Tea business. Can you please send me a copy of the ebook? Thanks for contacting us. I would be happy to send you that information. I just emailed you a copy of our ebook. Please let me know if there are any questions that I can help you with! Hello mike, I’m quite interested with the bubble tea business could u please send me a copy? Thanks! Thanks for contacting us. I would be happy to send you our ebook. I just emailed a copy to you. After you have had a chance to read it, please let me know if you have any questions. Thanks for contacting us. That is exciting news! I just emailed you a copy of our ebook. I look forward to hearing how your shop is coming along. I’m interested in starting a Boba Tea business. Can you please send me a copy of the ebook? Thanks for contacting us. I would be more than happy to! I just emailed you a copy. Enjoy! Can I get a copy of your ebook as well? Hello! this site is very interesting. Could you please send me a copy of your e book? what sizes do you do the custom cups(please can you share the diameters and depths)and what type of plastic do they come in please? Can we purchase just the cups and film from you as I already have the cup sealing machine (but it a manual). The most common cups are PP which are 95mm in diameter. The come in 12oz, 16oz and 24oz sizes. We also have 98mm PET custom cups available. Thanks for contacting us. That is exciting news! I would be happy to send you a copy. I will also email you our machine prices. Please send me the copy of the ebook, Thanks! Thanks for contacting us. I just emailed you a copy of our ebook. Please let me know if there is anything else I can help you with. Awesome! We were looking for a starting point in investing into a boba/tea house. Thanks for sharing your knowledge. Would it be possible to receive the eBook as well Mike? Thanks! Thanks for contacting us. I am so glad you found the information to be helpful. I would be happy to email you a copy of our ebook. I look forward to hearing back from you on how things are progressing. Could you please send a copyof the ebook? Thanks for contacting us. That is exciting to hear that you are looking to open your own bubble tea shop! I just emailed you a copy of our ebook. Please let me know if you have any questions. Could you please send me a copy of the ebook and catalogs? Thanks for contacting us. I would be happy to email you that information. Where are you thinking of opening a store? Could you also send me a copy of the ebook and catalogs as well? I am a business student who is trying to write a business plan about opening a shop. Thanks for contacting us. I would be happy to send you that information. Best of luck with your business plan! Thanks for contacting us. I would be happy to send that information along. Best of luck with writing your business plan. Could you send me a copy of your ebook? Thanks for contacting us. I would be happy to email you a copy. Please let me know if you have any questions that I could help you with. I would love to learn more about the bubble tea business and how i could start up. Could you send me a copy of your ebook as well? I would like to learn more about the bubble tea business. Could you send me a copy of your ebook as well please? I am interested in starting a Boba Tea business and I would love to learn more and read your book! Could you send me a copy of it please? It would be much appreciated. I’m looking into starting a Bubble Tea shop. Can you send me the ebook that you had mention in other posts? I’m very interested in opening my own boba shop. Would you kindly send me the ebook you mentioned, it would really help me out in getting started. Thank you! Hello Mike, I am just graduating from Business School. Rather than finding a job, I would like to run my own business. I am interesting in Bubble tea business. I have been searching the way to walk through my business plan, then came across your “How to write a business plan” article. I was hoping if you could share and send me your copy of your ebook to help me with my business plan. Thank you in advance! Hello Mike. I keep coming back to this article of yours because we are planning to put up a small shop at our location. Could you please share with me as well the free ebook? Hi Mike i am planning to open a store near my location. Can you please share me ebook to help in my business plan. Thank you in advance. Hi Mike, I’m planning to put up a small bubble tea shop. Can you please share me and could you send me a copy of it please? Thank you in advance and your help much appreciated. God Bless Always! Hi my husband and I are thinking of opening a boba shop. Can you please email/share your ebook and catalog. Thanks! Great article, thinking of opening a bubble tea shop in London. Could you please share you ebook and catalog via email? I would to open a Boba tea business in the Philippines. Can you send me an email and ebook as well as your catalog. I am interested in opening a tea shop in OK. May you please share with me some information such as the product catalog and ebook? Thank you so much!! Hi, I’m on the business planning stage and badly need ideas.. kindly share yours! Working hard now to develop a business plan for a bubble tea house, could you please send me your ebook? Thanks so much! I’m thinking about starting my own boba tea Place here in Sweden! I’m very interested in your ebook, can you please send it to me? Your article was very informative. I am recent graduate. I am interested in starting up my own boba shop in Phoenix, Arizona. Would you be able to send me the e-book as well? Thanks for contacting us. Congratulations on finishing your studies! I just sent you an email and our ebook. I hope you find the information helpful. Let me know if you have any questions. Hi mike, i am planning to start my bubble tea business, would you share your ebook with me as well? Your article made me very clear and helped a lot. Would you be able to send me your e-book as well? First of all thanks for writing ur article it cleared a lot of things for me. I am planning to start my own Bubble tea shop and would like to have some more information. Is it possible for u to send me your E-book for some more information? Thanks for contacting us. Glad that the article helped clear things for you. I just sent you an email and our ebook. I hope you find the information helpful. Let me know if you have any questions.